NEW ALBANY, Ind. 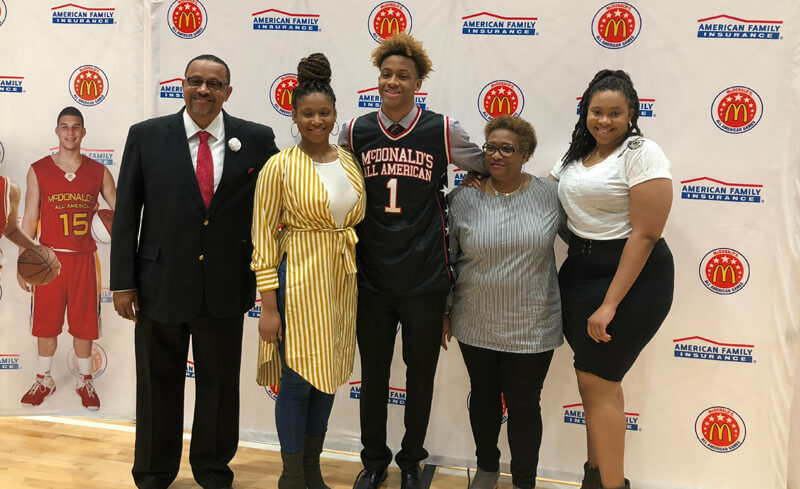 – Romeo Langford’s mother, Sabrina, has watched her son grow into a high school basketball legend in Indiana. But there’s more to Romeo than just basketball. Following his announcement, Inside the Hall spoke one-on-one with Mrs. Langford on what it’s been like to watch her son go through the recruiting process, his progression as a basketball player, how he’s stayed grounded and more. Inside the Hall: I know as his mom, you are very proud of Romeo. And the character aspect of it means more to you than the basketball part of things. What has it been like to watch him handle this whole process the way that he has? Sabrina Langford: It’s been unreal, really. I was sitting back thinking about it earlier today and something came on television about the announcement and it was just unreal that my little son, my little boy, Romeo, has grown into this and has all of these people so interested in him and following him. It’s been unreal. You see it on TV, but living in the moment, it’s like you have to pinch yourself and ask if it is real. ITH: I talked to his fourth grade coach a few weeks ago for a story and he talked about knowing back then that Romeo would be a special player. When did you have the feeling that maybe he was going to be special as a basketball player? You never expect this, obviously, but when did you know he was really talented? Langford: I don’t know if it’s bad to say this, but I would just watch him play and enjoy himself … and I never really thought further ahead than that. I really didn’t realize it until middle school, maybe the eighth grade. And that’s when I finally realized, he’s going to go somewhere. He’s very special. ITH: How have you and your husband kept him grounded throughout this whole process? There are a lot of kids who go through the recruiting process and aren’t able to handle it like he did. The way he interacts with people, the autographs, he doesn’t have to do all of those things, but it seems like it’s important to him. Langford: His sisters. Once he leaves the court and the games and all of the fans give him attention, they remind him who he is. He’s just little Romeo. We never liked it when we would go to games and saw people showboating. And Romeo has been to a few games when he was younger when his sisters played … and we would just point out to him certain characteristics in other people and asked him what he thought about it. We just talked about it to never think that you are better than anybody else. Never, ever do that. Once you start doing that, it’s going to be downhill from there. ITH: I know you would have been happy with wherever he went, but the fact that he’s just going to be two hours up the road and you’ll be able to watch him closely … as a parent, I’m sure that’s exciting. What do you think it will be like the first time he puts on the IU jersey and walks out in front of those fans? Langford: I don’t know and I don’t know what to expect, but I’m looking forward to it. I’m expecting something big, but I just don’t know. How refreshing to see a very talented kid with his attitude. It seems to me that his humility will make him a great team player. Can’t wait until next year! Great family. Love the mom. My favorite dad quote was Tim saying one of the reasons Romeo chose IU was archies emphasis on defense. Nice lady and great interview. I love Romeo’s family. They will have a great time coming to watch Romeo in Btown. ITH sure has a way of making our summers seem extremely short. Might have to take a break, LOL. Actually, I take it back. My favorite Tim Langford quote was him saying “Hoosier Historical” instead of “Hoosier Hysteria.” Classic, literally. LOL. You can see why Romeo is such a good kid. Has great role models at home. We’ll know what his nickname is after we see him play…it has to be something “organic”, like McFly or McFloorburn. Watch baseball….that will slow things down. Ha ha that would send me into the twilight zone. I took note of his comments about romeo and RP also. It was very interesting. But hope he learned not to talk God and politics on this forum (saying to the person previously known as bball, et al). His basketball insights are usually valuable and appreciated. His atheistic and politicosocial commentary, not so much, as witnessed by his temporary banishment. You Langfords are a great family. Thank you for being part of this human family. Gonna love this next bball season.